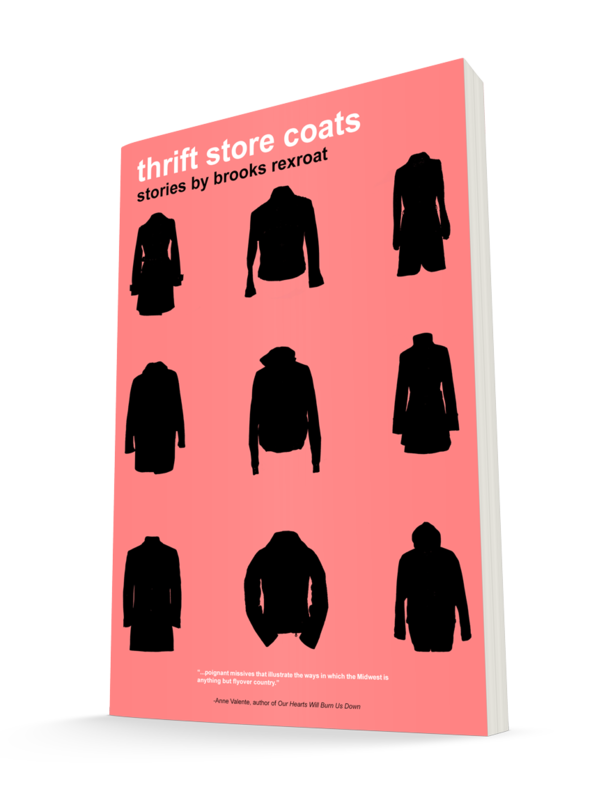 We here at Orson's Publishing are beyond thrilled to bring Brooks Rexroat's Thrift Store Coats to you, a collection that has been described as striking, poignant, and haunting, and whose twelve stories "... illustrate the ways in which the Midwest is anything but flyover country." Now based at Brescia University in Western Kentucky, Rexroat spent the 2016-2017 academic year as a Fulbright U.S. Teaching and Research Scholar at Novosibirsk State Pedagogical University in Siberia, Russia. He was a 2014 Bread Loaf Bakeless Camargo Fellow in Cassis, France and his stories and essays have appeared in more than 30 journals and magazines on three continents. Recently, Brooks sat down with us and answered some of our most pressing questions in the only way he knows how—with heart. *This interview involves Orson's Publishing (OP) and Brooks Rexroat (BR). OP: The idea of place plays an important role in Thrift Store Coats. Towns, cities, and landscapes serve as characters in a lot of ways. Is place something you contemplate often? As a writer? As a human? If so, in what ways? BR: Place is so critical. I’ve moved around a good bit and explored even more. I have acute wanderlust: I love to find new cities and neighborhoods and tucked away spots that others might not bother to seek. I’ve lived in a lot of places that would be considered edges: from living on the coasts in Ireland and France to living on the edge between the Rust Belt and Appalachia, the border between the north and south, and so I’m really sensitive to the extreme difference that a couple of miles or kilometers, a few degrees of latitude, a few pixels on a map can make in the way a person’s life unfolds, and that’s something I’m really interested in exploring. Growing up along the Ohio River and knowing the difference that seemingly arbitrary marker has made in so many lives just underscores it for me, I guess, and so it’s a thing I’ve always paid special attention to, in life and on the page. OP: Do you think that people in the postindustrial Midwest have been left behind? If so, in what ways? BR: Not at all. In fact, I think it’s one of the more exciting places on earth right now. All over the region, cities are reforming and urban cores are regenerating. Fresh ideas are percolating and the maker economy that’s showing up is really just a continuation of the large scale industry that’s mostly left. We’ve got an awesome legacy of making things here: for our grandparents, it was raw materials and heavy manufacturing, but I think the care and pride they’d passed down led to the build up of exciting restaurants and great coffee roasteries and craft breweries, great music scenes, great theatre, awesome writing communities—you name it.. We’ve left behind the large scale of industry, but this is a region full of people who create and care, who do things passionately. Yeah, things cycle and there are adjustments between eras, but I don’t think we’ve been left behind. If anything, being abandoned by giant corporations may, in the long run, give us more agency over our destiny. Now, with that said, I know this ethos hasn’t stuck everywhere, and I know there are towns and communities, cities that are still hurting from job loss and economic policy. OP: What about Thrift Store Coats was the biggest challenge for you? BR: These texts were written over a pretty broad timeframe, when means necessarily that I was in different developmental places for many of them, and in revision it took a lot of work to even them up. "Destroying New Boston" and "Basement Party" were part of my graduate thesis and they were both published right around the time I finished that degree. I collected other stories around them all the way up through "Abigail Newton Goes to Church Alone Again", which was one of the last stories I wrote before heading to Russia and really turning my focus to the batch of stories that came from my Fulbright experience. That’s a span of about eight years, and the quality of writing at the moment of composition was pretty different. It was a little hard to go back to a story written and published years ago and try to re-shape it into something that fit the tone and style of what I’ve been working on more recently, so finding the motivation to do it was difficult. OP: You’re a professor of writing at Brescia University. But you also have several writing projects going on currently. How have you been able to balance writing and the teaching of writing? BR: I think it helps me to keep in perspective that there are different seasons for different emphases. And different rhythms, too, in both life and writing. A lot of folks swear to writing every day, but I’d drive myself nuts if I did that. So, some days I focus on student work and some days I focus on my work, and sometimes I rest—which sounds like a revolutionary thing, but it’s just absolutely critical to find moments of rest and regeneration. It’s tough, sometimes, because often an idea will hatch at just the time I’ve had 60 essays and a dozen stories roll in, but I try to take good notes on prospective stories and create space when I do get a chance to focus on my own work. OP: You probably enjoy teaching a lot of different courses. But what’s that one course that makes you giddier than the rest? BR: I love intro fiction, because those students are just starting and aren’t afraid to do something strange and goofy, and I love to walk with them as they figure it all out. No one has told them, “No” yet, and it’s invigorating to be there with them in those first moments of trying and slipping and regrouping, but it all happens in this beautiful, bold, unafraid way that I adore. OP: What does Day One of your writing process look like? What about Day Thirty? BR: It’s sometimes hard to pin down where day one actually is. I tend to notice something that feels like it might be a story and kick it around in my mind for a while, let it nudge up against other ideas or images or things I’ve noticed or heard about. At some point, something stimulates the idea and I sit down to write it. It’s really uncommon for the writing of a story to take more than a day or two. I’ll spend months revising, but by the time the idea has shaken its way through my head, the story is generally pretty well formed that first day, and it’s a process of fast typing. Then I set it aside and wait a while to revise, first by refining scenes or adding characters and then generally adjusting the text to become deeper and hopefully more meaningful to anyone who might read it. OP: What made you decide that writing was it, that it’s what you wanted to pursue? Can it be whittled down to a moment? Is there one writer, in particular, that you can point to and say, "They inspired me to travel this path"? BR: I’ve always been a storyteller, sometimes to everyone’s detriment. My parents got me a tape recorder when I was still a toddler, and it was the coolest thing on earth. In hindsight, the gift was more a relief for them than a generosity: it gave them a break from hearing me talk. The serious, adult reckoning with the written word came during an office conference with a composition professor. It was just a half-paragraph, stuck in the middle of 20 minutes of discussion, that went something like, "You can do this, you know, for a living. It’s not just a daydream. Writing is a thing people do work, and you should consider it." I was 17 at the time, and man: that just jabbed its way inside my mind. There was no coming back from that kind of statement. Functionally, I became a reporter first. That’s a tough job, but it taught me the most critical things to be a good writer and teacher of fiction. It taught me to watch and listen, to take careful stock of what I was seeing and hearing, and it taught me to produce work professionally and cleanly, to take responsibility for writing daily and for making every draft and pass something that was careful and thorough and clear. OP: How does your revision process usually unfold? BR: I’m a high-volume reviser: I’ll read the story a number of times, generally focusing on one area each time. The first pass might be ensuring complete scenes, the next might focus on character consistency, the next on dialogue, then punctuation, then sentence-level language and so on. It’s generally one trait per pass that I look for, and the number of passes and order of focus depends on what I’m trying to accomplish in the story—or what fascinates me about the characters, action, or setting. BR: I think perspective is what I value most from a literary community. I want to read stories and poems and essays from different perspectives, and I love hearing the perspectives others bring to my work. I think digital literary communities sometimes shut this idea out: too often, we look only for people who will validate us or we seek out people we can diminish, to our own benefit. I think most of us have been guilty of occupying those spaces at some point, but it’s just not a healthy place to be. In the end, I think the most enjoyable and satisfying thing about a literary community is the chance to listen without critiquing and simply know what’s happening in the brain of someone who has encountered the world a little bit differently than I have. Thrift Store Coats, Rexroat's debut story collection, is now available from Orson's Publishing.